Do our children really have to be on the “fast track” of learning so early on? These days, many parents worry that it’s essential to teach children academics as early as possible – that the earlier they learn basic skills, the better chance they’ll have of eventually getting into a good college and succeeding in life. But could that be doing children more harm than good? The natural way to learn is through play. “Play is to early childhood as gas is to a car,” says Kathy Hirsh-Pasek, psychologist and author of A Mandate for Playful Learning. “Children who learn through play develop social and emotional skills, which are critical for long-term success.” The most effective play is free of evaluation and correction (after all, throwing a ball shouldn’t be “right” or “wrong”), while promoting autonomy. A child at play is exploring infinite possibilities, and learning all the while. That’s why it’s important to find a preschool with the right emphasis on play. Find a school that puts a priority on learning through play. For young children, play is unstructured and freeing. It’s not about expensive toys, in fact, the simpler the toy, the more ways it can be used by a child developing his or her imagination. Toys and equipment should be carefully chosen, first for safety and then for how they stimulate young imaginations and help children develop. Look at the total school environment. The right environment will be clean and safe, with spacious places to play, as well as the resources to provide imaginative, rewarding playtime. Look for a caring and well-trained staff, a critical element for any preschool. How children are treated is as critical to their development as what they are taught. Ask about enrichment programs. Look for a preschool that offers a wide variety of engaging programs, for example, yoga, manners and world cultures. 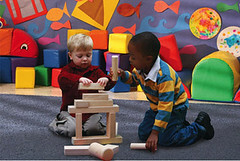 These programs develop the whole child by encouraging their innate curiosity and imagination. Be sure to ask if these programs are included in the tuition. For a child, play isn’t optional. The educational and other benefits of play are so important – in terms of healthy bodies and minds – that parents should put play at the top of their list when thinking of their young one’s development. Halloween is a magical night where the world of make-believe comes alive for children, but it can also be a great time to practice good manners, good sense and good fun! The Goddard School and Trampoline Learning provide essential tips for a safe and happy Halloween. Avoid masks that make seeing difficult. Opt for face paint instead. Be sure that children can walk easily in their costumes. Hem if necessary. Wear comfortable walking shoes. While high heeled shoes are fancy, it’s easy to fall in them and little feet will tire quickly. Provide children with a glow stick or add reflective tape to their costumes so that they can be seen by cars as it gets dark. Plan your route so that children do not become overtired. Agree ahead of time about how many houses you will visit. Explain that children must stay with parents and that they should walk, not run from house to house. Take the opportunity to explain that normally children should not speak with strangers. Remind them that Halloween is a special time when it is alright for them to go door to door because you will be with them to keep them safe. Share your expectations about using good manners BEFORE you go out. 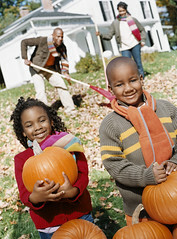 Let children practice trick or treating at their own door a few times. Reward good trick or treating manners with a treat! Bring a flashlight to light the way. Start early before it gets dark. Be sure children are traveling in small groups accompanied by a responsible adult. Only go to houses where lights are on, preferably those in which you know the resident. Be respectful of people and property. Use sidewalks. Remind children that it is not polite to walk through gardens, hedges or across lawns. Cross only at intersections and crosswalks. Watch for moving vehicles. Be careful around lit candles in jack-o-lanterns. Ring the door bell or knock on the door only once. If you are with a group, wait patiently for your turn. No pushing or shoving! Say, “Trick or treat!” in a loud, clear voice. If you know the homeowner, greet them with, “Hello, Mr./Ms. ____.” Make eye contact as you speak. Be sure to say, “Thank you!” or “Happy Halloween!” once you have received your treat. Discard treats that are unwrapped, loosely wrapped, damaged or homemade. Limit the amount of candy your child can enjoy in one sitting. Agree on a number and stick to it. When it comes to good manners, one could argue that it takes more than just saying “please” and “thank-you” to be looked upon as a respectful and courteous individual. It’s important that children learn, at an early age, the principles of good manners and how to show respect and kindness toward relatives, friends and even strangers. World Kindness Week, which is celebrated November 9th to 15th, and the upcoming holiday season offer a perfect opportunity for parents to begin teaching their children good manners and how to be respectful and kind towards others. Polite greetings, such as saying “hello” and “goodbye,” using a person’s name in their greeting, shaking hands and answering in a clear voice. Getting along with others, by playing fair, being patient, being helpful, being generous and respecting privacy. Table manner skills, taught by showing children what to do before they eat, while they eat and after their meal. Telephone manner skills, such as speaking up so they can be heard, answering the phone with courtesy and hanging up using their goodbye manner words. Everyday manner skills, including being quiet in a library, respecting people who are older, covering one’s mouth when coughing, yawning or sneezing. It’s important to teach children that having good manners is a reflection of themselves, as well as a reflection of their family. It’s a part of the foundation of learning that they will use the rest of their lives. My five-year-old daughter cannot seem to keep her hands and feet to herself and I am getting reports from her teachers that it is becoming a problem at school. She is not doing it meanly (she’s not hitting or kicking), just trying to tickle, hug on, and poke at other kids. We have had consequences at home (both negative and positive reinforcement) and when we talk with her about the behavior she has the right answers and knows it is unacceptable. How then do I go about getting her to keep her hands to herself? This is a typical developmental stage as children learn about personal space and interacting with peers. I recommend requesting a formal meeting with the school, to start. See if the teachers are seeing the behavior at certain times of the day, and if so, is there a way to change the environment to stop the behavior. For example, does it happen at the table during snack time, is it the same child that she is touching–if so, consider separating them for a bit. During this meeting, talk to the teachers about consequences for the unwanted behavior. It is important to come up with a consequence that is consistent between home and school. So if the child exhibits the behavior at home, the outcome is the same. Try this, along with positive reinforcement when appropriate behavior is observed. Director of Education, Goddard Systems, Inc. There comes a day when your child will ask to sleep over at a friend’s house for the very first time. Whether because of homesickness or fear of bedwetting, sleepovers can turn into a nerve-wracking experience for children. As parents, how can you prepare for your child’s first sleepover? What should you expect? Here are some helpful tips to guide parents and children through the first sleepover. Start somewhere comfortable. Spending the night in a strange environment with lots of other kids for the first time can be scary. Try arranging a sleepover with a favorite cousin first. The familiar environment might be less intimating than going to slumber party with ten other children. Send a comfort item from home. Make sure your child packs a favorite pillow, blanket or stuffed animal – any item that brings your little one comfort. If the child is feeling nervous during the night, she will have something to snuggle up with. Communicate with the host. Talk to the slumber party host’s parents beforehand. Discuss any special requests such as keeping a nightlight on or a reminder at bedtime to use the restroom. Talk with your child. Once you’ve decided that your child is ready for a sleepover, have an open and positive discussion. Ask your little one what he/she thinks the overnight adventure might be like. Answer any questions, and share tales from your own slumber parties. Be prepared to “pick up.” If your child becomes homesick or scared, he/she might just want to go home. Always be prepared to get the unexpected call to come pick up your child during the night.